December 30th is a day of reflection in my family. My father passed away on this date long ago, forever casting a shadow over this festive season. It doesn’t mean one can’t celebrate. If one occasionally eats & drinks oneself into a place where one is blissfully in the here and now of sensations, surely one can be forgiven, whether that hedonism is to escape or celebrate. Christmas is a time of rebirth and new beginnings, and by association invites us to contemplate our good fortune, our blessings, and to give thanks. The musical world commemorates anniversaries of composers long-dead, but hopefully not forgotten. 2010 was the year of the Chopin bicentennial, whereas 2011 has seen at least two great composers celebrated, both of whom mean far more to me than Chopin. This is the end of a year celebrating Liszt and Mahler. Franz Liszt was born 200 years ago, while Gustav Mahler died a century ago. As a young child I was regularly taken to a Lutheran Church in Scarborough, particularly in the years when my father was diagnosed and gradually dying, and of course also after his passing. Near the end, the pastor’s family took in the children while my mother sat by my father in a hospital. I was so young that I remember almost nothing, so that this has passed into the family mythology, an amalgam of tales re-told. The time spent with the generous pastor was a kind of purgatory, given what was taking place in the hospital, before returning to a family radically changed. I have a dim sense of what came before, but only know that there was always warmth and kindness, my father having providentially made arrangements for his widow & children. And the church was part of this blurry memory. It shouldn’t be surprising that after awhile we drifted away from the church. Each family member had their own story, but mine goes something like this. I started to question, particularly given that we were not going every Sunday morning. I came to think of myself as an agnostic, recognizing that I couldn’t really know one way or another. I was not an atheist, and feel very strongly that atheism is really another faith category. No, I was just in a kind of agnostic limbo, perhaps unaware that I was waiting for something to catch my attention, win me over. The title for this piece may seem odd, considering that I have been rambling on about my childhood, while mentioning Mahler & Liszt in passing, without making any connection. I recall being reminded in various church choirs that we are ministers, not just because we put on funny gowns that take away our individuality, while making us seem somewhat symbolic in the ritual space of a church. It begins with the idea that many eyes may be upon us. We shouldn’t pick our noses or behave in a manner to wreck the experience of those coming to the church in search of some kind of solace or comfort. We may not recognize the roles we play, but we’re privileged to be part of this sacred process. Music is one part of the service, right? it occurs to me that music and musicians minister to us whether we’re in church or not. There are many pathways that can lead one back to the church after one has lost their way, as I had. During the intervening years before I came back, I found something spiritual in the works of Gustav Mahler. His Second, Third and Fourth Symphonies were particularly illuminating for me, in various ways rekindling a long-dormant process of meditation. Dead embers came back to life gradually. The vivid moments in the last movement of the Second Symphony encouraged me to visualize the Resurrection in my mind’s eye. It’s counter-intuitive, but this quirky composer, tormented by the anti-semitism he faced throughout his career seemed like a messenger showing me the path. Did Mahler convert to Christianity to get a job as conductor of the Vienna Opera? It’s a matter that’s not known with certainty. What we do encounter, embodied in his symphonies, is an unconditional theology that is a perfect match for that current demographic that self-identifies as “spiritual but not religious.” There is no hell in Mahler, just Heaven. For those who are lost Mahler is as welcoming as Alcoholics Anonymous or a homeless shelter, a warm & fuzzy pathway back towards faith. 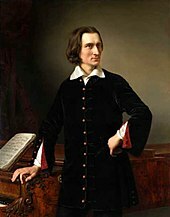 Liszt may seem less likely as a pathway, but I believe that’s because his reputation as a virtuoso overshadows other notable achievements over a wonderful long life, and one of the most under-rated figures in the history of music. The Liszt of “Lisztomania”, a friend & champion to other artists? In modern culture, collaboration is the norm, especially in multi-disciplinary forms such as theatre and film, but it’s hard to imagine life before artists learned how to work together. I believe a lot of this begins with Liszt. Berlioz’s fame spread via Liszt’s piano transcription of Symphonie Fantastique, whereby the world discovered music that otherwise was not being programmed, and would therefore have remained unknown. We can’t really grasp this nowadays, when music is ubiquitous and cheap via radio, CD, and other media. But when there were no recordings, how else would someone discover new music? Liszt made so much money as a concert artist that he became a philanthropist, helping the poor, funding new schools and academies, and taking artists under his wing. When Wagner was in exile following the failed 1849 uprising in Dresden, Liszt not only gave him a place to shelter his family but produced and conducted Wagner’s romantic operas in his theatre. In addition to his generosity & mentoring spirit, Liszt showed me something very simple and fundamental. His transcriptions of Beethoven, Berlioz, Wagner, Verdi, Schubert, alongside his own compositions are sometimes dismissed as virtuoso trifles. I am not proposing to evaluate anyone’s achievements, only to speak of a joyful pathway. Sometimes we sit down to make music following the procedures set before us, fearful of playing wrong notes and infused with the negativity that pedagogy and music teachers condition into us, a lack of independence of spirit drilled into us by too much respect and awe for those who came before. Liszt showed me the fun, channelling selflessly what was in the score. I am not saying I am a good composer, only that I would never have found any confidence or self-knowledge without first having felt the bravery in Liszt’s own handling of the music of others. I felt better about my arrangements of Christmas carols, my versions of Beatles tunes or my own various attempts to transcribe symphonies, after playing through some of Liszt’s transcriptions. I felt similar joy with transcriptions by Rachmaninoff (his Mendelssohn, Tchaikowsky and Schubert) and Busoni (his Bach!!). I lost my fear when i felt that joy. When I sat down to accompany singers I stopped worrying about notes and started to think about making music, which became a spiritual channel. Every year music has become more and more enjoyable. How ironic that the man most closely identified with the role of the romantic virtuoso transcended the egotism of that role in his maturity. I may seem to be retrospective as I face the new year. It’s funny to think that I know where I am going because I am looking behind me. Thank you Gustav & Ferenc, for what you gave us, the delights and the lessons, the examples you set and the wonderful compositions still reminding us of you. This entry was posted in Essays, Spirituality & Religion and tagged Bach, Busoni, Liszt, Mahler, Rachmaninoff, Tchaikowsky. Bookmark the permalink.